Painting as exploring mark-making itself; mark-making freed of all its referentiality to the material world, to history, to story-telling, to materialistic pretension. One question that immediately arises: What makes mark-making specifically human, and if human, hand-made [as opposed to human and human-machine-made]? Another is: What if everything else is stripped away and we only see marking? Marking without explicit representation anywhere? 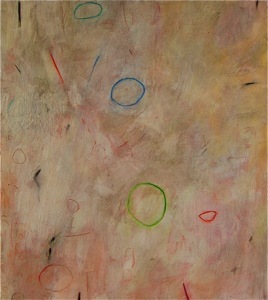 Specifically, marks on a flat– and thus “to be read” surface, thus de-emphasizing, even denying, its material thing-ness?